A new 7-inch studio viewfinder has been designed for camera operators needing to work long hours on live events. Blackmagic Design has announced a new viewfinder for its URSA mini camera that turns helps customize it for professional studio applications. The 7-in studio viewfinder has been designed for camera operators that may be required to work behind the camera for several hours, as it is fully adjustable and has physical buttons for fast operation. Blackmagic has also developed a new version of its Camera Update 3.2 software, that adds features such as talkback, tally, camera control and lens control from ATEM switchers. The company also announced a major new camera operating system for the URSA Mini, which features a new user interface and added features for improved performance. In the area of multiviewers, the Blackmagic MultiView 4 allows customers to monitor four completely independent SDI video sources on a single display. 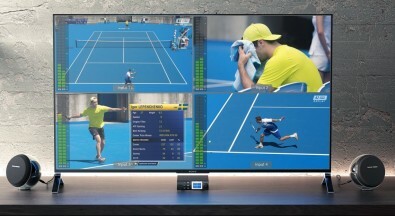 If customers output to an Ultra HD display, they will get four times the resolution of a simple HD only multi viewer. Finally, Blackmagic has introduced two new compact Micro Converters: The Blackmagic Micro Converter SDI-to-HDMI unit and the Blackmagic Micro Converter HDMI-to- SDI version. The first converts signals from professional broadcast equipment such as cameras, decks, switchers and routers, and converts it into HDMI so customers can monitor video using big screen televisions and projectors. The Blackmagic Micro Converter HDMI to SDI model lets customers connect their HDMI equipment, such as laptop computers, gaming consoles and consumer video cameras, to professional broadcast equipment.